What happens when two public figures weigh in on a controversial issue? It’s thinking diversity write large! In July of 2017, Elon Musk, CEO of Tesla and SpaceX, and Mark Zuckerberg, CEO of Facebook, clashed on twitter over their differing views on the safety of Artificial Intelligence. The viewpoints they expressed can be summarised as caution vs optimism. Both prominent businessmen are players in the AI field, with Tesla featuring autonomous driving and Facebook performing ever more complex algorithms to mine our data for advertisers. Zuckerberg has stated that he believes that developing AI will save lives and improve our quality of life. Musk has criticised Zuckerberg for not fully showing respect for the risks of accelerating AI research. Whilst advancements in AI could lead to fewer road deaths and improved medical outcomes in the near term, a super-advanced AI could eventually outstrip humanity’s ability to understand or control it. 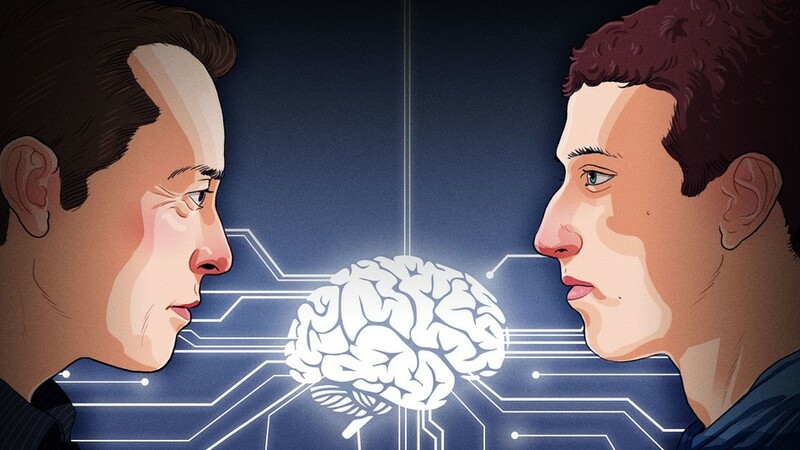 Musk publicly chided Zuckerberg on twitter, saying his understanding of the subject was “limited.” This typifies Musk’s approach to subjects, as he has a deep knowledge of many areas of engineering which he has brought to bear in his technical leadership of his companies. Zuckerberg is more focused on the opportunities that exploiting AI could bring in a tangible timeframe, and this typifies his leadership of Facebook and it’s meteoric growth. From what we know of the two men from their public personas and presentations they have given, we could hazard a guess that Musk is a Present-Past thinker, an archetype we call The Engineer. This thinking style is characterised by being driven to understand topics deeply and having a strong sense of the right way to do things. Zuckerberg has a more mercurial persona, and embodies a very ‘silicon valley’ way of thinking. The Visionary archetype seems to fit him well: someone who can see the potential in a great many things and has a knack for getting people to follow his cause. Most issues are not clear cut – there are multiple sides to most problems. Our individual thinking styles lead us to naturally engage with the world in a way which makes the most sense to us, feels most comfortable. However, we must always remind ourselves that ours is not the only viewpoint on a subject, and effective collaboration, supercharged with clear communication, is our best bet at achieving the very best outcomes. In the case of AI, Musk and Zuckerberg both have valid points. We’d do well to listen to them both and hope that when it comes to solving humanity’s biggest challenges, we don’t let our egos get in the way of Whole Thinking. The Thermo Maps is a MindTime Map, with the corners representing Past, Present, and Future thinking, and each square has a colour which represents the average score from our audience. 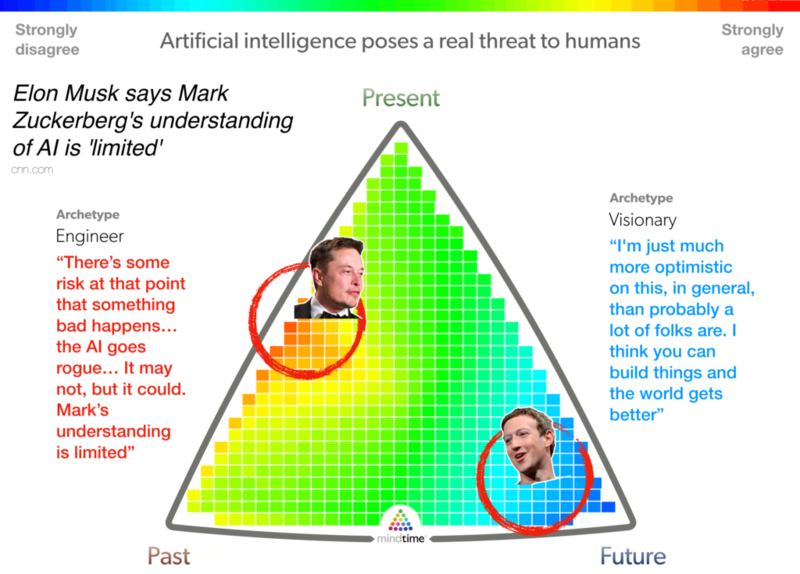 In this case, we see a general agreement with the statement (AI is a threat) from the Present-Past thinkers (The Engineer archetype) and a general disagreement (AI is safe) from Future thinkers (The Visionary archetype).